svn tag page trac tag page. Code revision up to 28576 (28574 for all except Lion). Tag revision: 28579.
svn tag page trac tag page. Code revision up to 28436 (28381). Tag revision: 28436. Binaries for Windows, GNU/Linux 32 and 64 bit, Mac Leopard. Binaries for Windows, GNU/Linux 32 and 64 bit. svn tag page trac tag page. Tag revision: 26551. Actual binary release revision: 26544. The revisions are slightly later for the 64 bit linux and later still for the Mac Leopard binary. It may take some time for the Greenstone installation dialog to appear. Once the installation dialog displays, you generally need to keep pressing the Next button until it is finished. However, when it asks for the location to install Greenstone in, make sure to choose a location on your file system for which you have access privileges. If you want to install Greenstone into C:\Program Files on Windows 7 or Windows Vista you will need to run the installer with administrator permissions (this can be achieved by right clicking on the installer and choosing "Run as administrator"). And if you wish to use the Greenstone Administration pages (which will be needed if you want to create user accounts for a Remote Greenstone server), then now is a good time to set a sensible password for that. It has to be between 3 and 8 characters long. The windows version can be installed anywhere, including paths with spaces and brackets (these caused a problem in releases prior to 2.85). To change the language in which you view your Greenstone digital library pages, click on the Preferences link at the top left of your Greenstone digital library home page. On the Preferences page, select the interface language in the drop down box. To change the GLI interface language, run GLI, go to the File > Preferences menu. Then in the General tab, set the Interface Language. If your script is not covered by the Latin 1 charset, then you may also need to set the Font to something that supports your script. In such a case, try setting the value for the Font field to Arial Unicode MS, BOLD, 12. If you wish to work with password protected collections, here's a workaround to the bug of constantly requiring to authenticate yourself. Then run it by passing in the text-only flag. Perl 8 or later. For windows, you can get ActivePerl. Download the Source Component tar.gz file that matches with your Greenstone binary version, and put it in your Greenstone installation folder. Move the ext/gnome-lib-minimal out of the way or rename it to something else. Make sure JAVA_HOME is set and the bin folders for Java and Perl are on your PATH. Then unzip the downloaded gnome-lib minimal package into your greenstone2-home/ext folder. Note also that some Linux machines don't need gnome-lib at all, in which case, the first compilation step above would just be ./makegs2.sh. To tell whether your Linux machine needs gnome-lib, try compiling it without it first. If compilation fails during wvware, then you need gnome-lib. The Mac Mountain Lion and Leopard machines we tested it on required gnome-lib. Note also that on 64 bit unix systems, -fPIC is automatically prepended to the CFLAGS environment variable by the ./makegs2.sh script, as this tends to be needed for compiling. :: call "C:\Program Files\Microsoft SDKs\Windows\v6.1\Bin\SetEnv.cmd"
Get the source component zip file from the downloads page. Unzip it in your Greenstone installation. If Windows prompts you about whether you want existing folders merged (and existing files replaced), tick the box to confirm for all and click in the affirmative. It will prompt you whether to extract certain important files. Type Y to do so. It will next present you with various compilation options. You want to type 4 ("All") to tell it to compile everything. It will take some minutes to compile after which, if there are no errors, you can start running GLI or the gs2-server. If you want to re-compile GLI go into your Greenstone's gli subfolder: cd gli. Next, type: makegli.bat. To re-compile the GLI jar files, such as used for Remote Greenstone situations, type: makejar.bat. Note that some Linux machines don't need gnome-lib at all, in which case, the first compilation step above would just be ./makegs2.sh. To tell whether your Linux machine needs gnome-lib, try compiling it without it first. If compilation fails during wvware, then you need gnome-lib. The Mac Mountain Lion and Leopard machines we tested it on required gnome-lib. You will need to enable the Administration pages if you want access to them. Do so by editing your Greenstone installation's etc/main.cfg file. Change the status field value from disabled to enabled. In that case, you may also want to change the admin password for the Adminstration pages. Use a DOS prompt to run: gsicontrol.bat configure-admin which will allow you to (re)set the password for username admin (the default admin password is the same as the username). The password has to be between 3 and 8 characters long. Get the source distribution zip file from the downloads page. It will take some minutes to compile after which, if there are no errors, you can start running the gs2-server. If you want to run GLI as well, this will need to be compiled. To compile it, go into your Greenstone's gli subfolder: cd gli. Next, type: makegli.bat. Once it's done, you can run gli from the commandline with gli.bat from inside the gli folder, or with gli\gli.bat from the toplevel Greenstone installation folder. If you wish to compile up the GLI jar files, such as for Remote Greenstone situations, run the following from within the gli folder: makejar.bat. You will need to enable the Administration pages if you want access to them. Do so by editing your Greenstone installation's etc/main.cfg file. Change the status field value from disabled to enabled. In that case, you may also want to change the admin password for the Administration pages. Use a DOS prompt to run: gsicontrol.bat configure-admin which will allow you to (re)set the password for username admin (the default admin password is the same as the username). The password has to be between 3 and 8 characters long. If you work with another browser, then type the command you'd use to launch that from the terminal, suffixed with %1 once again. (Embed %1 in quotes if you've installed Greenstone in a path containing spaces.) NOTE: If GLI's Preview Button does not succeed in launching the browser with the collection URL, consult this page for a suggested solution. Deals with several security vulnerabilities that were present in previous versions of Greenstone 2 and which were recently brought to our notice. DSpace-inspired Depositor. It also allows multiple values for various metadata fields such as author and subject keywords. See this page for how to enable it. New option for List classifier: standardize_capitalization. Metadata values are lowercased for sorting into bookshelves. With this option set, then the lowercase value will be used as the bookshelf Title. This can then be changed to title case/upper case etc using CSS. Without the option set, then the majority case variant will be used. For example, with three values (snail, Snail, Snail) then Snail will be used. Improvements to authentication when super collections (cross collection searching) are used. When there is no authentication needed for the entered collection, any collections that have collection-level authentication will not be searched. When the entered collection was authenticated, then for each collection we check the collection's groups against the list of groups for the user, and if there is a match, then the collection will be searched, otherwise it will not be. Note that document-level authenticated collections will always be searched, as the authentication happens when you click on a document link. This only works with the link to the greenstone document, and cannot be used to restrict access to eg pdf files. Year only dates in a DateList used to crash the local library server. Fixed thanks to DL Consulting. The DateList reverse_sort option now works properly when years are grouped together. [srclink] now works for DateList. Bug fix for remote GLI where moving files would fail with long filenames. GLI format editing box now provies coloured highlighting and Ctrl-Z for undo. Greenstone now works on 64 bit linux. windows?? OAI downloading - will now download all records unless max_records option is set. new script activate.pl - deactivates the collection in a running server, moves building to index, then reactivates. Can be called by itself, is included at end of full-rebuild.pl, or can be run after building by adding -activate to the buildcol.pl command. new options for List classifier: -filter_metadata and -filter_regex. Only include documents in the list if they contain the specified filtering metadata, and if a filter_regex is specified, that metadata value must match the regular expression. Code updated to allow cross compilation. Eg compile on Linux to produce Windows binaries. Support for compiling on Android NDK. MARCPlugin - will now extract all occurances of a subfield, not just the first one. Ability to add user comments to document pages (see below). New XSL transformation file (in gli/classes/xml/xsd-to-mds.xsl) that can be used as a helpful template when needing to convert a metadata schema that is in XSD format to Greenstone's metadata set format. New CDWA Lite metadata set for GLI, generated by applying xsd-to-mds.xsl to CDWALite's XSD (http://www.getty.edu/CDWA/CDWALite/CDWALite-xsd-public-v1-1.xsd). collection are no longer detected automatically. There is a further change to be made if you are working with collections with underscores in their names. Pascal D. Angst on the mailing list noticed that such collections caused issues with the RSS links produced for their documents. He came up with a helpful fix to the apache webserver's Rewrite rules (in bold below). His fix, which is shown in lines 4 and 5 in the two snippets below, may be more generally applicable. To apply his fix to all relevant instances, in a text-editor open the Greenstone installation's apache-httpd/<your-operating-system>/conf/httpd.conf.in file. If you had already built the collection, you can Preview it straight away. Any document page in the collection should provide a link in green at the bottom labelled Add Comment. If you're not already logged in, you will be taken to a log in screen and, once authenticated, you can proceed to add a comment. Once you're done leaving comments, you can press the green Logout link. User comments cannot be added if the GS2 server is run from GLI. Run the standalone GS2 server to add user comments instead. Go to your Greenstone home web page. Enter the username and password for the new user. The password has to be between 3 and 8 characters long. OAI-PMH support has been provided for some time by Greenstone, but there have previously been a few functional gaps, as well as a bug in version in 2.84. From version 2.85 onwards, all official OAI-PMH validation criteria have been tested and satisfied; you will be able to validate your own OAI-PMH server using instructions given in the release notes. If you don't specify the urls for the associated documents in the metadata, the system can automatically generate internal urls so that users can access the full documents from the harvested OAI records. You will also now be able to harvest OAI-PMH records and the associated documents residing in external Greenstone collections (in 2.84, harvesting worked to access information in non-Greenstone collections, but there was problem in harvesting from other Greenstone collections). Prior to version 2.83, reliable import of, and metadata extraction from, pdf files was limited to PDF versions 1.4 and earlier. Starting with 2.84 a new "PDF Box extension" has been available as a separate download to handle all PDF versions. This extension file need only be placed in the ext subdirectory of Greenstone for the improved PDF handling facilities to be operational (see the release notes). The PDF Box extension has been further improved from version 2.85 onwards, so be sure to download, unzip and insert an up-to-date PDF Box extension for this version, replacing the version of the file which you may have downloaded for version 2.84. To switch to version 2.86 from an earlier Greenstone version with minimal risks, you could i) back up your collections, ii) install 2.86 in a new home directory (to specified to the installer), and iii) copy the collect sub-directory from the old to the new version. If you are presently using a recent previous version of Greenstone (2.8x), the collections should be immediately available for use; if not, particularly for collections built under older versions of Greenstone, it should suffice to rebuild the collections under the new version. Any problems can be addressed to this list or the main Greenstone users list (http://list.waikato.ac.nz/mailman/listinfo/greenstone-users). If you move your Greenstone 2.86 installation folder to another location at any point, then (with the server still stopped), you would need to run "./gsicontrol.sh reset-gsdlhome" on Linux and "gsicontrol.bat reset-gsdlhome" on Windows. If you forgot the admin password (as is required to access the Administration Pages and to use Remote GLI), this can be reset by running "./gsicontrol.sh configure-admin" on Linux and "gsicontrol.bat configure-admin" on Windows. The password has to be between 3 and 8 characters long. These instructions are more Greenstone 2.86-specific than the general instructions for setting up Greenstone 2 as a remote server. The following are steps to follow if you're on Windows. On Unix based systems, you can skip steps 1 and 2, otherwise things are similar. For instance, on Unix systems, you'll want to launch *.bash or *.sh script equivalents to the batch files listed. Also, you'll want to use forward slashes (/) instead of the Windows' backward slash (\) when specifying file paths. 8. Enter the username and password for the new user. The password has to be between 3 and 8 characters long. Diego Spano's presentation on Greenstone and OAI. This gives a good background about OAI, as well as a very useful overview of Greenstone's OAI support. The PDF Box extension provides support for conversion of PDF documents to text. It supports the latest PDF versions (unlike Greenstone's standard pdftohtml program), so it's useful for collections with new PDF documents. Download the extension from here, which is available in tar.gz and zip formats, and unzip into Greenstone's ext folder. The PDF Box extension does not require additional software to be installed. WSASYSNOTREADY error will appear in any machine that has port 80 in use, not only Windows 10 machines. Even more, if you enable Windows firewall, you will not be able to run Greenstone too. If you have WAMP or XAMP in your machine, GS will not run. Sometimes, antivirus will block Greenstone too. I mean, there are many reasons that will have conflict with Greenstone. If you distribute DVDs, before burning the image, change the file llsite.cfg and replace the line "portnumber=80" with "portnumber=1000" (or whatever you want). Thanks to Diego for suggesting this workaround: The GS 2.86 installer does not include key.gdb file, so if you have a collection with authentication you must enter username and password for every page you visit. However, if you copy any key.gdb file it works ok! Grab this empty key.gdb file and place it in your Greenstone 2 installation's etc folder. Then re-run the Greenstone 2 server, and you will only need to authenticate once. import.pl> Malformed UTF-8 character (UTF-16 surrogate). When GS converts a text file like a PDF it takes the text and converts it to html or text (it depends on Windows or Linux). That html is then converted to a Greenstone archive format, a kind of xml file. To convert the file to xml GS has to replace symbols like "<" and many others that are restricted chars for xml format because they are part of the xml syntax. For example, the "<" symbols is converted to "&lt;"
It can be possible that PDF document has something inside that corrupts this process, I mean, some characters inside the PDF can not be converted. The intention is to replace each "unknown" char with a simple space. This way, the raw text suffers no modifications and can be indexed by GS. Installer runs and installs successfully but GLI.app executes and terminates. installs and the GLI.app works correctly. using the Mountain Lion version of the 2.86 release). Gord also tried out the Leopard binary of 2.86 on a Mac Leopard 10.5.8 and found that the version of Java supported by that Mac did not work with the version of Java required by the Greenstone binary. The Leopard machine here that we used to generate and test the Leopard binary specifically had Java 1.6 installed as the default Java in order to get Greenstone to work. - If you have Java 1.6 installed on your Leopard, make it the default Java, for which you need to have admin privileges on the machine. Go to the desktop and in the toplevel menu, navigate to Go > Utilities > Java Preferences. There set the default Java version to Java 6. - Then try to run the Greenstone 2.86 for Leopards on the 10.5.8 machine. Bad version number in .class file. User goes to Apple Support and downloads Java for Mac OS X 10.5 Update 10. Tried installing greenstone again, and got the same error message. 1. Go to your Greenstone 2.86 installation folder's "lib/darwin" subfolder and move the file "libsqlite3.dylib" up one level (into the "lib" folder). In later versions of Java, unsigned or self-signed java applet jar files are not displayed in Windows browsers. 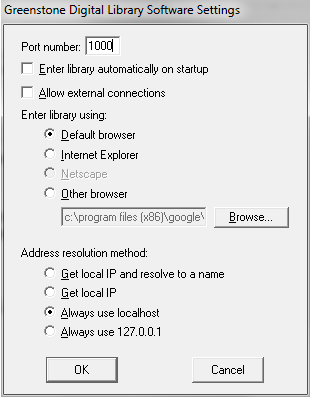 To allow your browser to display them, on Windows, press Start and go to Control Panel > Programs > Java. In the Security tab, press the Edit Site List button and press Add to add the base URL of the Greenstone library server. For example, for the nzdl.org site, you would add http://www.nzdl.org. If accessing the GLI applet, you would follow the same procedure but add the URL of the remote Greenstone server. The CDS/ISIS plugin now works on 64 bit Linux too. However, at the time of the release it did not work on 64 bit Macs including Mac (Mountain) Lions. There is a patch for this now. If you're using a Mac (Mountain) Lion GS2.86 binary or if you're unable to explode your ISIS file, or tried to process your ISIS files with the ISISPlugin and your files didn't get processed properly, then you may be dealing with a 64 bit Mac too. To check if your Mac is indeed 64 bit, open an x-term and type uname -m and hit enter. If the response is x86_64, then your machine's 64 bit. Put this in your Greenstone's bin/darwin folder. Rename the file to IsisGdl, replacing the previous binary that already exists there with this name. Warning. The librarian interface failed to locate an appropriate version of ImageMagick. Images can be included in collections but no image processing functionality will be available, such as converting images to a different type, or generating thumbnails. rename or remove the old ImageMagick version at <your-Greenstone>/bin/darwin/imagemagick. Or move it out of the way. Please consult the Greenstone FAQ at http://wiki.greenstone.org/wiki/index.php/Greenstone_FAQ to see if any of your questions are answered and for workarounds of known issues. If any issues persist, write to the Greenstone Mailing List. Kamal Salih Mustafa Khalafala of the University of Khartoum Institute of Environmental Studies Library for Arabic translations, both the work done in 2012 as well as in 2013. Important: If you are one of our valued translators and have contributed again since the 2.85 release, and we missed adding your name here due to unfortunate oversight, then your name belongs in the above list. Therefore please contact us and we'll be thrilled to add you in here.